Take a look at the Ohio Athletic Conference Men’s Basketball standings. Here, I’ll make it easier. As you can see, the Pioneers sit in eighth. Â Eighth is good though, from the standpoint that you get to make the OAC Tournament. Â But the Pioneers need to be careful tonight against the Capital Crusaders. Â The Crusaders, who are sixth in the standings, already lost to the Pioneers once this season. Â However, Marietta is coming into tonight’s game riding a three-game losing streak against #2 John Caroll, #5 Baldwin Wallace, and #7 Mount Union. With six conference games left, Marietta is one game ahead of #9 Otterbein. Â Otterbein plays #1 Wilmington, and with a loss, could fall two games behind. Â Further, if the Pioneers simply beat Capital, Otterbein and #10 Muskingum a second time, then the Cardinals would need to win all of their remaining games. Â The Muskies would be eliminated from contention. 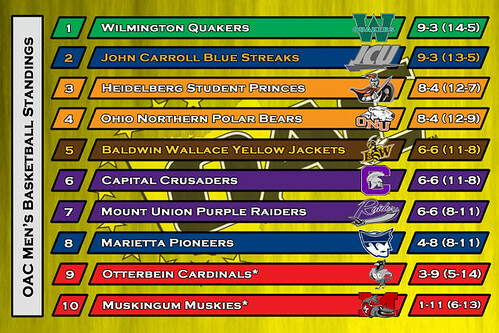 As far as the OAC’s automatic bid to the NCAA Division III Basketball Tournament looks, it could go to either Wilmington or John Carroll, depending on how the conference tournament plays out. Â One thing is for sure though: Â Wilmington is ranked in the region (not nationally though), and could potentially receive an at-large bid to go dancing if they were to lose to John Carroll. Â We’ll monitor the situation at the end of February to see what pans out. The Pioneers Men’s Basketball team continues their quest for a second straight conference tournament bid tonight when they play Capital at 7:30 PM at Fenton Court in Ban Johnson Arena. Â They will then face the #3 Heidelberg Student Princes at Fenton Court on Saturday, scheduled to start around 3 PM (The Women’s Basketball Team plays Saturday at Fenton Court at 1 PM). Â For these dates and more, check out the Writing on the Mall Calendar. 7 PM at Fenton Court tonight.Â Be there.Â Witness the final home game of the regular season for the Marietta Pioneer’s Mens Basketball team.Â They’ll be taking on the Mount Union Purple Raiders tonight.Â The Pios are still in the hunt for a 5th seed in the OAC tournament, which would allow the Pios to avoid John Caroll and Capital (Nationally ranked teams bound for the Division 3 Tournament) for at least the first round. With a win tonight against Muskingum (7-7 Conference, 10-11 Overall), your very own Marietta Pioneers (6-8 Conference, 11-10 Overall) will be guaranteed to make their first OAC Tournament since the 03-04 season. The win would put the Pios at 7-8 in the conference, which would mean that Baldwin-Wallace (3-11 Conference, 7-14 Overall) would have to run the table in their four games to at least force a tie.Â Marietta currently has the tie-breaker, as they beat B-W earlier in the season.Â Moreso, they play again at B-W in a week or so.Â But things could come down to the final game of the regular season if Pio Power disappears.